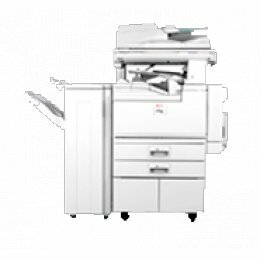 The versatile Aficio MP 4500 is a digital system that suppors advanced network printing, scanning and faxing in one compact platform. Plus, industry-leading security technology protects your business information at every stage. Available in 5 different configurations. Easy to navigate large, touch-screen control panel. Handles paper sizes up to 11" x 17". Full finishing options include hole punching, booklet finisher and three position stapling. Crisp 600 dpi resolution copies in 256 levels of grayscale. Electronic Sorting eliminates need for a mechanical sorter. Standard 128 MB memory, expandable to 384 MB. Standard 40 GB Hard Disk Drive. Scan Once, Print Many with fast, clear output at 45 ppm. Standard 10Base-T/100Base-TX, USB 2.0 interface. Optional interfaces include IEEE802.11b Wireless LAN, IEEE1284, and Bluetooth. Easy to use Ricoh RPCS icon-based print driver interface. Supports PCL5e / 6, Ricoh RPCS and optional genuine Adobe PostScript 3. Optional PDF Direct Print lets you send PDF files directly to a printer without opening the application, reducing network traffic. View settings and manage documents from any connected PC via standard web browser. Print files can be password-protected and held in memory until released by the owner for increased security. High performance 600 x 600 dpi network printing at 45 PPM.